The beautiful Hand Painted Butterfly Urn is a porcelain cremation urn with exquisitely detailed butterflies. 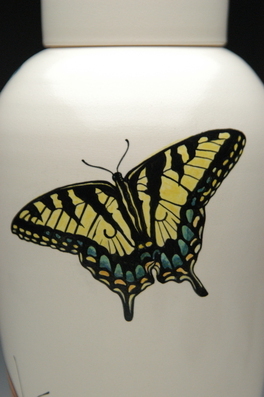 Since the butterflies are each hand painted, we can customize this urn with a specific color of butterfly if you wish. The urn is made of Grolleg porcelain which is a very high quality porcelain. Our ceramic artist has over 30 years of experience working with ceramics and is an accomplished artist as well. Engraving for up to four lines is available at one low price. Our Engraving process will permanently affix the Engraving to the surface of the funeral urn. Available fonts are Sans, Chancery, Celtic Garamond, Herculanum, Old Script, Diploma. 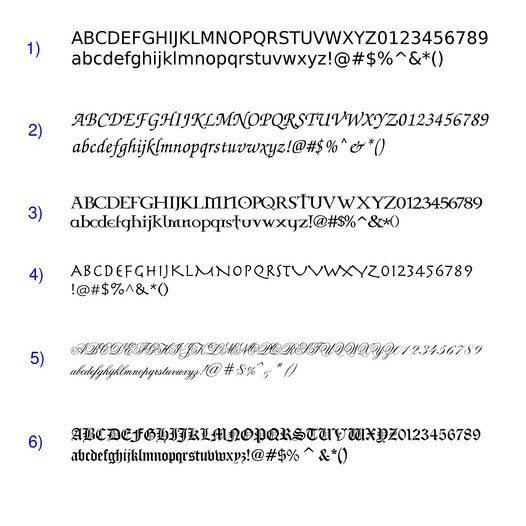 Please see image of fonts below or by clicking on the tab titled Detailed Images. An engraving proof will be emailed for your approval prior to the urn being engraved and shipped. Please allow 2-3 months before this urn ships as this is a custom urn and each butterfly is hand painted.